Hi, friends! 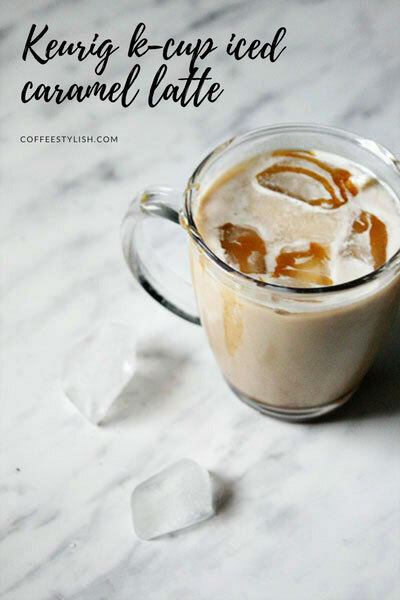 Today I’m sharing my no fail iced caramel latte recipe for Keurig k-cup brewers. Only 4 ingredients, less than 2 minutes of your time and absolutely no planning needed. You won’t believe how easy it is! 1. Brew your favorite dark roasted k-cup at 4-ounce setting. 2. Put 4 large ice cubes in a glass and really slowly! pour coffee over ice cubes. 3. Add 2 tbsp caramel sauce or dulce de leche and 4 ounces of cold milk. Stir well. 4. Top with whipped cream (optional) and drizzle with a generous amount of caramel sauce.